A prayer book for one and for all, for personal prayer and family blessing, The Work of Your Hands gives voice to the prayers of the heart. Diana Macalintal lifts up the extraordinary and the ordinary moments of life in humble yet beautifully wrought prayers that evoke our longings, confess our fears, and sing of our joys. Offering praise and asking for blessing, she helps us recognize the presence and grace of God in the work and play, the up and down of daily life. Diana Macalintal is the director of worship for the Diocese of San Jose and holds a Master of Arts in Theology from Saint John's University, Collegeville. She has served as a liturgist, musician, author, speaker, and composer for the last 25 years, and her work can be found in Give Us This Day and many other publications. Author of The Eucharist Catechist's Guide, Macalintal and her husband Nick Wagner cofounded TeamRCIA.com, a free online resource that trains catechumenate ministers worldwide. St. Paul's tells us to `pray without ceasing' (1 Thess 5:17). Diana Macalintal responds to that happy admonition in her poetic The Work of Your Hands. Whether you are looking for a prayer for procrastinators on the feast of Saint Expeditus or a prayer when Mass feels empty, a blessing for those in love or a blessing for graduates, Macalintal will help you lift your minds and hearts to our gracious God. And graced prayers and blessings these are. Diana Macalintal is that rare and gifted artist who has the ability to describe the indescribable. This collection of prayers is the promise of a personal retreat, a moment away from the noise of our daily lives. All great artists summon us beyond ourselves and after spending time in this collection of prayers, you will emerge from this book's pages a different person than when you first opened them. Someone will be fed or held in your care for your having spent time in the world Diana opens to us. People often wonder what they should pray about and what to say when they pray. Diana Macalintal's prayer book answers both questions in ordinary and extraordinary ways. She helps us learn to pray in the most ordinary circumstances and leads us to the extraordinary grace that comes of lifting up our daily lives in prayer. Her words become our own prayer and at the same time offer us a lesson in how to pray. Because her subjects and vocabulary are ours, too, her prayers easily become the work of our hands and hearts. Ever feel tongue-tied in prayer? Ever wonder what you could say to God and how you could say it? Let Diana Macalintal help you with this new book of her poetic prayers and prayerful poems. They are both beautiful prayers themselves, and beautiful invitations to deeper meditation and richer contemplation. I read a lot of books and manuscripts but this one caught me by surprise. I could not read it in one sitting. I kept it near me (on my iPad) and took up one prayer after another, slowly letting them sink in. This is a book I would keep on my nightstand for many years, a book I would never put away. From the tender words in the introduction to the final Amen! it's fantastic. It comes from the heart of Diana Macalintal whose passion creeps into every line. But make no mistake: it's beautiful but it's also disturbing. Certain lines of these prayers will not fade away from your heart easily; they will linger until God has touched you through them with his power. Diana Macalintal offers us a creative and inspiring source rich in possibilities. 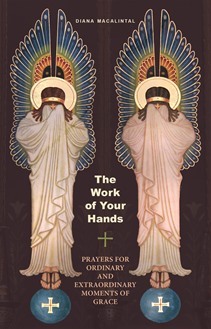 The Work of Your Hands-a collection of prayers and blessings, touching the ordinary and extraordinary rhythms of human life are sure to enrich our spiritual journey. Savor an outstanding and fresh resource for everyday reflection, for special celebrations and particular needs. Fresh, evocative language from the hands of one steeped in the richness of the scriptures and attentive to the deep longings of the human heart. Diana Macalintal has graced us with a gift-prayers for every season of life worth placing on our lips and planting in our hearts over a lifetime. This collection gives voice to the depths of our joy, pain and everything in between, helping us to see God's quiet and constant presence amidst it all. A great gem of a book. This is a wonderful collection of prayers covering a beautiful array of situations.